Photo of the front of a Premium Pilsner from Bavaria brand beer. Imported into Canada from the Netherlands. Bavaria is a brand from Bavaria N.V., formerly Swinkels Family. The front of a Gaffel Kolsch beer can. This beer is produced in Germany and imported into Canada. from the web site: The delicately bitter, pleasant, slightly hopsy taste is characteristic for this traditional product and clearly distinguishes Gaffel Koelsch from all other Koelsch brands. Photo of an Innis and Gunn beer can. This is the original Innis and Gunn beer. The can says that the beer is Bourbon Barrel Scotch Ale. 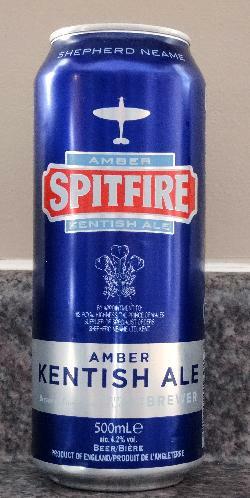 The is the 2018 version of the Spitfire Kentish Ale can. Brewed by Shepherd Neame brewery in England. This particular can was imported into Canada.